NextAmazing Women Who Inspire Us: Zina Nicole Lahr. 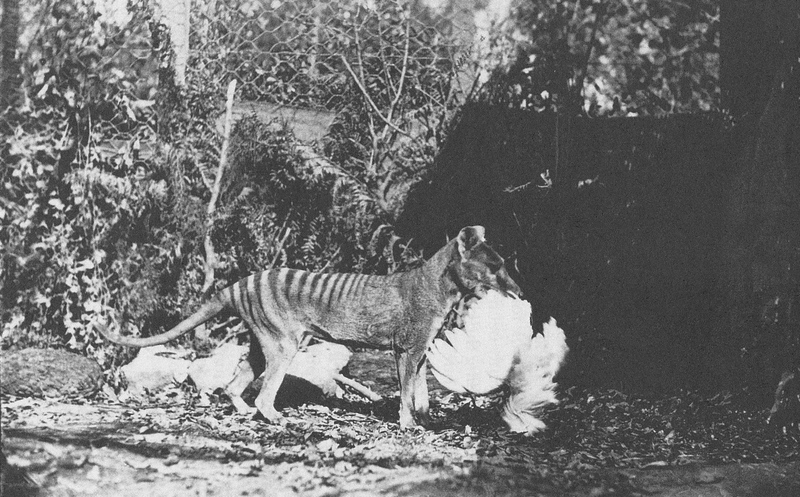 Brought to extinction: the Tasmanian Tiger. The Thylacine, also commonly known as the Tasmanian tiger, was one of the world’s most fascinating creatures. It first appeared millions of years ago in Australia extending north to New Guinea. However, by the time of the first arrivals of English settlers to Australia in the late eighteenth century, the tiger was extinct in New Guinea and on the mainland of Australia, expect for in the far south on the island of Tasmania. But in a little over a hundred and fifty years after the first settlements, the tiger would be brought to extinction in Tasmania too, largely due to the direct killing of tigers for the protection of Tasmania’s agricultural industry or for hunting and sport. The wider extinction of the thylacine over its long existence isn’t just related to human predation of the first English settlements. It is important to note that although some Aboriginal groups revered it as a species, many other Aboriginal groups saw it as an important source of food for over 30,000 years. To add to the thylacine’s distress, its natural enemy the dingo is believed to have contributed to both the thylacine and the Tasmanian devil’s extinction on mainland Australia. It is believed that the competition for food with the dingo, environmental causes and disease may have also contributed to its demise. The idea or dream that the tiger still roams free in the Tasmanian wild today is exactly that, a dream. 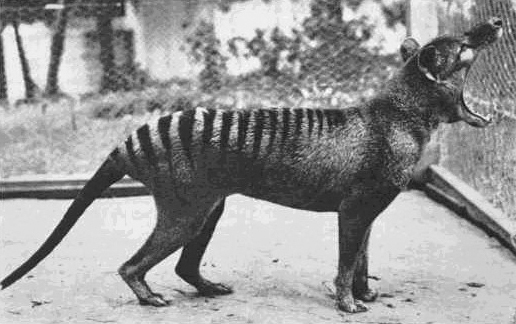 The thylacine or tiger became extinct seventy-eight years ago, on 7th September 1936, when the last known tiger died in the Beaumaris Zoo, Hobart. Though, that hasn’t stopped people in believing that in some remote corner of the Tasmanian wild the tiger still exists. Back in the early days after the last tiger’s death, people in the late 30’s and 40’s, truly hoped that it had survived. But as time went by and without irrefutable evidence, our hope in its existence diminished. This however, has not stopped the many elaborate hoaxes and stories that have circulated around decade after decade about how farmers, campers or tourists have ‘accidentally’ come face to face with this elusive marsupial. That said though maybe we should leave the door slightly ajar concerning the debate of its existence? The last known thylacine “Benjamin” is pictured here above at Beaumaris Zoo in 1933. Indigenous Australians left many clues for us with rock art like this thylacine found on a cave wall in Ubirr located within Kakadu National Park in the Northern Territory. The art work is believed to be some two thousand years old. So why do we crave for creatures like the tiger to still exist? It is firstly likely out of sheer curiosity. One simply cannot look past those distinctive jet black stripes along its back without being mesmerized and the fact that we truly don’t know enough about it. Secondly, I dare to say, we crave for its existence out of a feeling of guilt that we have, from contributing to its demise. History has taught us that we have on many occasions treated animal like the tiger in our past with contempt and fear. Popular mythology too, has tainted it as ‘a great object of dread’. Some have even likened it to a ‘blood sucking vampire’! The notion of the tiger as a significant predator of sheep was vigorously promoted. It was in our last century that sheep farmers in Tasmania took collectively action to wipe it out of existence. It is sad to think that we didn’t have the sense to take a greater stand to stop its killing. Sure the governments of the day eventually ceased the bounty they offered farmers and hunters alike, to eliminate the tiger. But it came a little too late for the fragile few that remained and eventually died out in captivity by 1936. What is frustrating of all is that there is little evidence that suggests that the tiger was a vicious predator against sheep, the livestock and backbone of most Australian farmers, as some like us to think. Yet its reputation as a ‘killer’ was one of the main reasons why it was almost hunted to extinction. If anything it was only an occasional or secondary threat upon sheep. The tigers diet historically had always been kangaroos and other marsupials, small rodents and birds. It was often wild dogs in Tasmania who threatened sheep stock in greater numbers, but many people chose to believe otherwise and through propaganda or other forms of misinformation the tiger was inevitably blamed. The notorious 1921 photo by Henry Burrell, of a tiger with a chicken clenched in its mouth, is an example of the damage nonsensical propaganda did to further harm the tiger’s reputation as a ‘killer’. The origin uncropped image (below) shows the tiger clearly in a captive environment. The cropped image that was published in the mid 1920’s was created to make us believe that it was a wild tiger on the prowl. There is also a theory that has circulated around that the tiger was in fact a staged taxidermy specimen. By the beginning of the twentieth century, the numbers of wild tigers and those in captivity was extremely low. Someone, somewhere finally woke up to themselves that this wonderful indigenous animal was on the brink of extinction. Efforts to breed tigers in captivity were attempted but with mixed results. With a late explosion of interest in zoos, wild tigers were also brought to zoos in an attempt to promote the diversity of native animals in Tasmania. However through a combination of terrible conditions, neglect and disease, in the end it all contributed to its final extinction. The irony of finally legally protecting the tiger came too late in 1936 for the last known tiger known as “Benjamin”. Benjamin’s death sentence was written by the insensitive and wildly offensive administrative decision made by Beaumaris zoo. In the end Benjamin died of neglect and exposure. We shouldn’t simply look at the death of the last tiger as its end. If anything we should use Benjamin’s death as a catalyst to help save other species that are close to extinction today. If we have learnt anything from wiping out species throughout history, it is that we need to educate and stop man’s obsession with wealth and greed from continuing its destruction of the environment, which includes all its creatures. We cannot leave ignorance to go unchecked, or we will find that our vast species (including ourselves) across this earth might be too late to save, like that of the thylacine. In 1999, the Australian museum in its effort to possibly bring back to life the thylacine began a cloning project. When I read this in my research for this article I have to admit I chuckled out loud at first. However, I then immediately recalled the famous case of “Dolly”, the domestic sheep who was cloned from adult somatic cells. Maybe, a thylacine wasn’t so far-fetched after all ? Apparently in 2002, progress in cloning a thylacine took another step forward when individual thylacine genes were successfully duplicated. With more work to be done, it is envisaged that cells would be implanted into the egg of a Tasmanian Devil, which is the thylacine’s or Tasmanian tigers only living relation. In 2014, this still seems far off from being reality, but it would be a wonderful sight if it happened? Photo Credits: The header image is a studio portrait of Mr. Weaver posing besides his thylacine trophy, circa 1860’s. 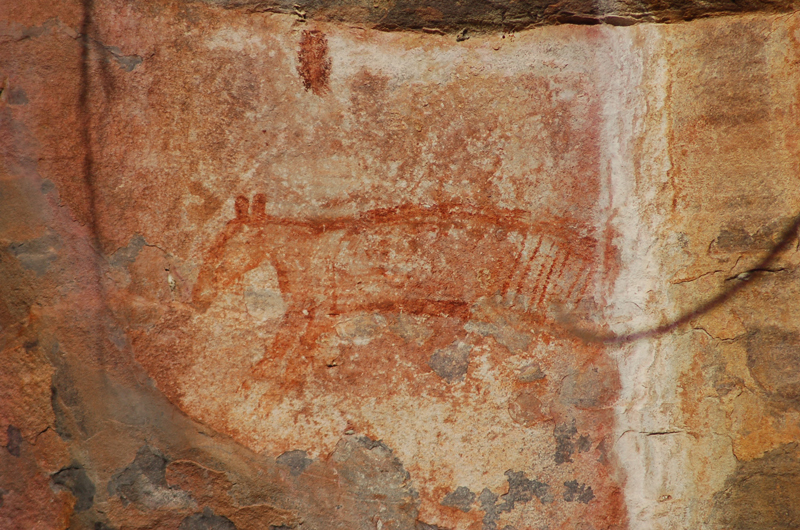 This photo and all other images are in the public domain except the photo of the thylacine rock art which is used under the Creative Commons Attribution-ShareAlike 2.0 license. Today is the birthday of my friend and frequent blog contributor Robert Horvat, so I thought (in addition to it being a great article) I’d share this interesting piece he recently did on the extinction of the Tasmanian tiger. Natural history isn’t something I do a lot of here, but it’s quite interesting, and he does a great job! Amazing Women Who Inspire Us: Zina Nicole Lahr. Revolution and the tale of the Granma.